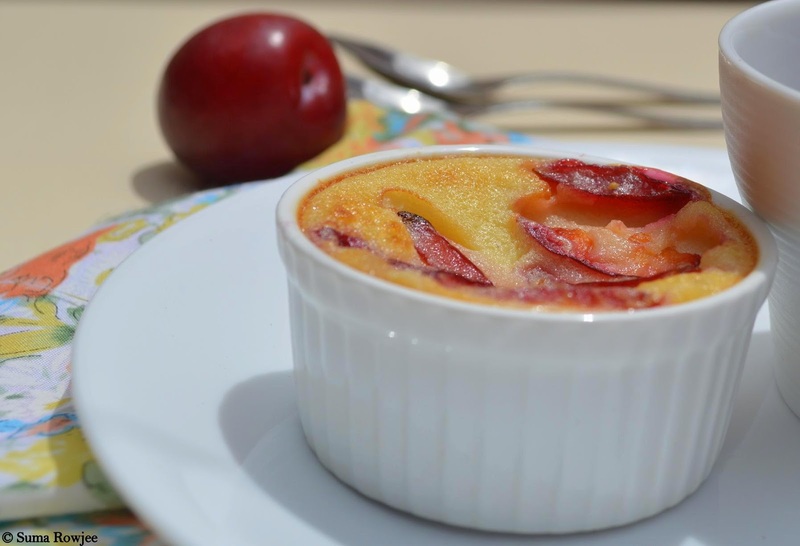 Cakes & More: Tartine's Clafoutis - With Plums! Happens every year. 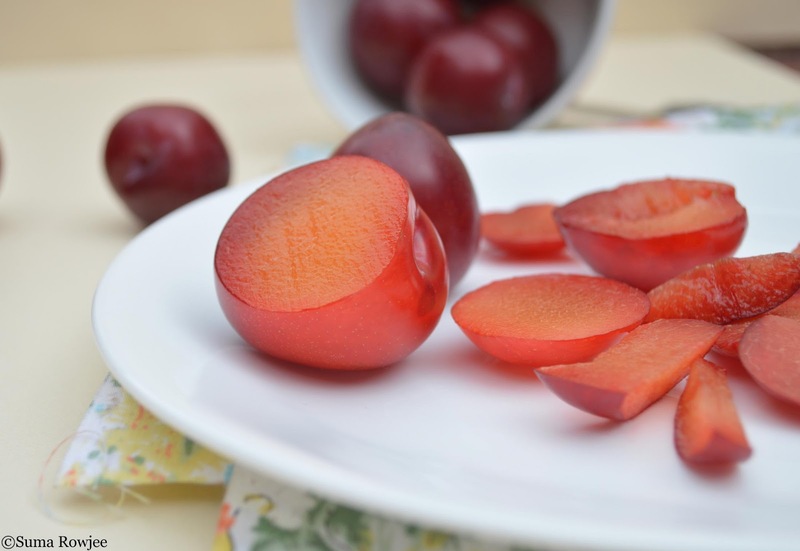 The season of gorgeous cherries, blushing peaches and ravishing plums. Not raving fan of these, I see them, I sigh and I walk away. If only I loved baking with them! I am not much of a cooked fruit person, which is why you are very unlikely to see me baking crisps, cobblers, crumbles and other fruity bakes. But I got lured into buying some plums, blame my new camera and my sudden interest in taking pictures! And then a plum clafoutis happened! 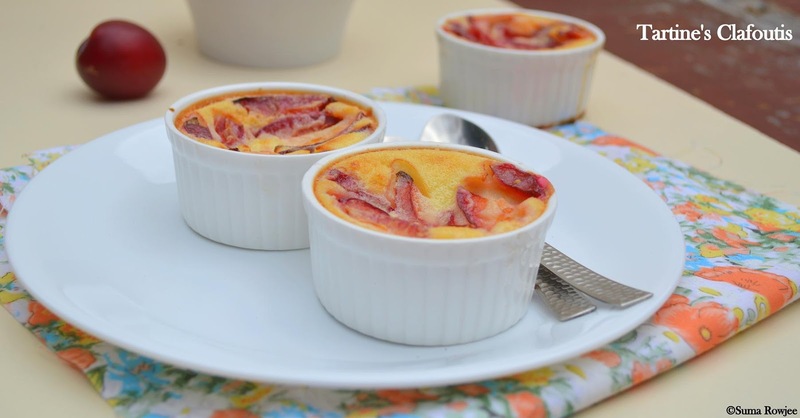 Clafoutis (Kla-foo-tee) is a rustic, pudding kind of French dessert, traditionally made with unpitted fresh cherries, the kernels supposed to release kind of almond flavor into the dish. You could use berries, peaches, plums, nectarines, pears or even apples. The fruit is sometimes sauteed in butter and sugar and put at the bottom of a pie tin or a cast iron skillet or ramekins. The batter is mostly just whizzing together all ingredients in a food processor or just combining the wet and dry ingredients, making it a snap of a dessert to put together. And even better - you could make this less or more rich using either just whole milk or half and half or cream. 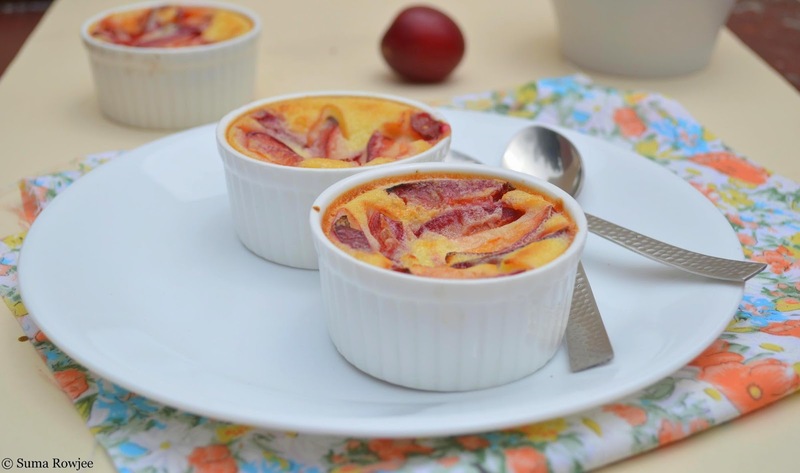 A simple clafoutis for breakfast or an indulgent clafoutis for dessert with a dollop of cream or ice cream. Now you see, why I had to bake one! My family loved their dessert, so more clafoutis its going to be! I stumbled upon this link on Mark's No Special Effects leading me to Tartine's Cherry Clafoutis. The method here is slightly different, process similar to making a custard, though I will know any difference in the texture only after I bake more clafoutis. 1. Preheat the oven to 220ºC / 425ºF. Butter the dish you plan to use. I have used ten to twelve 60 ml / 1/4 cup capacity ramekins. Recipe suggests using a 25cm (10 inch) ceramic quiche mold or pie dish. 3. While the milk mixture is heating, whisk the eggs and flour together in a heatproof bowl until smooth. I had to smoothen a few lumps so better to add flour in 2-3 additions. 4. Remove the saucepan from the heat and slowly ladle the hot milk, say 1/4 cup at a time, into the egg mixture while whisking constantly. Pour the mixture into the prepared mold and add the plums, making sure they are evenly distributed. 6. Let cool on a wire rack for at least 15 minutes before slicing. Serve warm or at room temperature. We liked it better at room temperature when the clafoutis had a creamier set. We liked the clafoutis (would have loved it more with ice cream), though can't say the same of the tangy-sweet cooked plums. A recipe and a dessert to be baked again for sure, fruit or no fruit, why ever not when its so easy and a no-fuss dessert idea I would love to play around with! 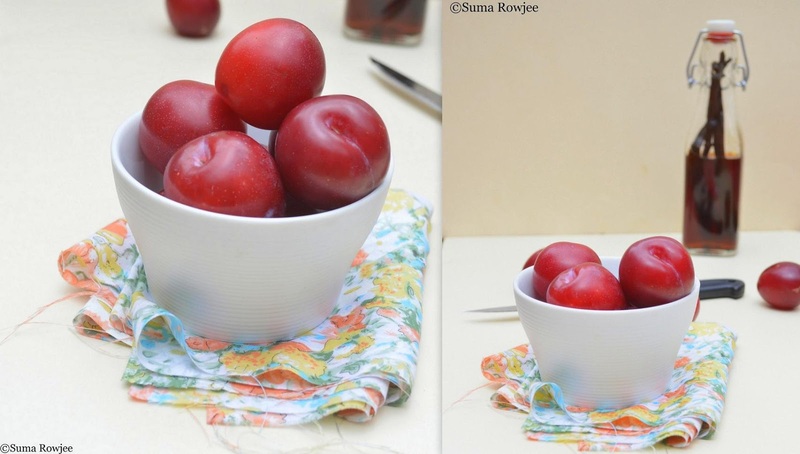 Amazing pics of tartines with plum. same here am not a big fruits in bake kinda person. they are o be eaten just out of the oven or the juices make it soggy. this clafoutis is awesome though.lovely clicks. Looks very delicious. I never make fruit based baked desserts. Will give it a try. Classic dessert! such crisp shots! Esp the cut fruit!! Thanks for dropping by, Suma! First comment is always special for me! This looks so good with fresh plums! do we just bake it by putting ramekins in over or do we keep the remekins in water bath? pls do let me know....planning to make it today.